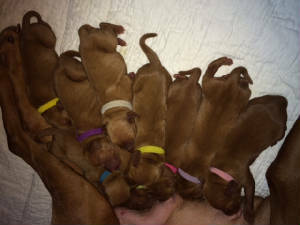 Our Nine Little Whiskey's! They have all gone to their new homes now! 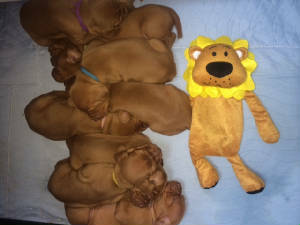 Ky's Vizslas welcome these new families to our list of puppy homes! News Flash! 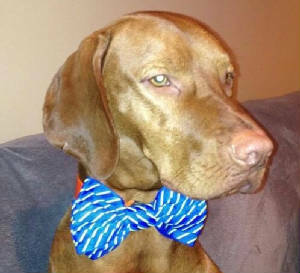 Romance and Excitement are in the Air at Ky's Vizslas! Jenny has been a Lady in Waiting and Whiskey is a Fabulous "Bow" (Beau)! 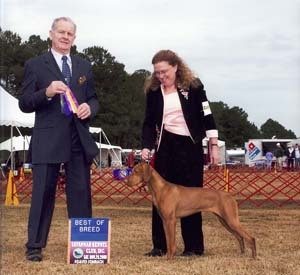 Both Parents are AKC Registered and both have accomplished their AKC Grand Championships! 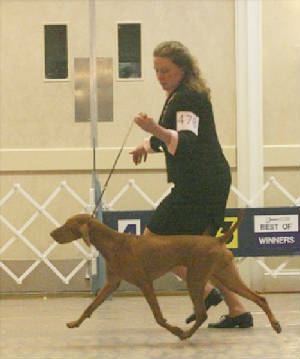 Both have had Multiple Group Placements as well as Multiple Best of Breed Wins. Whiskey has also had multiple Group Wins. 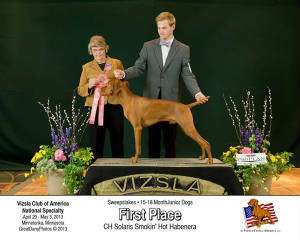 GCH Solaris Smokin' Hot Habanero "Whiskey"
UKC Champion with Multiple Group Wins! Best in Show at UKC Multi-Breed Show! 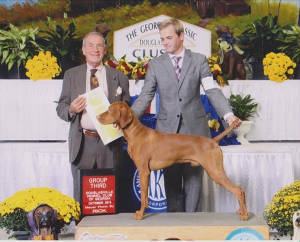 AKC Grand Champion and with multiple Group Wins! 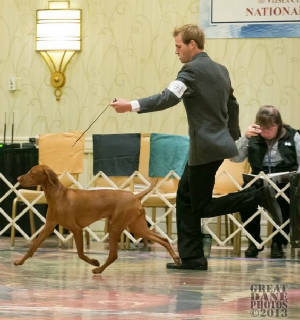 GCH Cj Watch'N Me Wynn JH "Jenny"
Happy New Year! We are expecting the pups from this breeding the last week of February. There will be a select few available for show/performance homes. 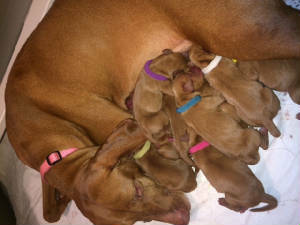 Please get in touch with us if you are interested in a puppy from this litter! Dr. Randal says all looks good and to expect a nice litter next Tues or Wed, February. 25 or 26! 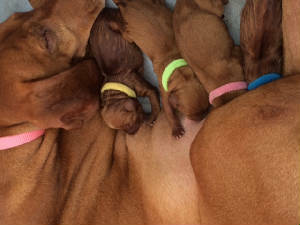 Pups Arrived on February 24, 2014! Mom and pups are just fine! 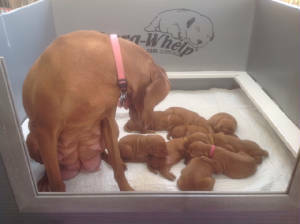 Week 1 Pups have all gained weight! 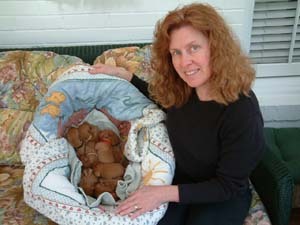 Mom "Jenny" is taking such good care of them. Week 3 Pups eyes are open and they are beginning to hear some sound, they have found their voices and are experimenting with them making sounds. These guys are growing so fast. at 3.5 weeks they have received their 1st puppy food meal! They are all weighing right at 3 lbs each. Then there were Nine Little Whiskies! And Jenny can move too! 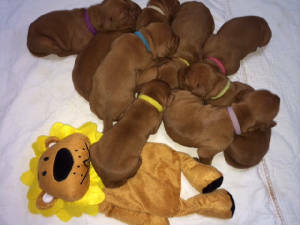 If you are interested in finding a Vizsla you may get in touch with me and I will be glad to assist you in finding a reputable breeder that might have pups available. 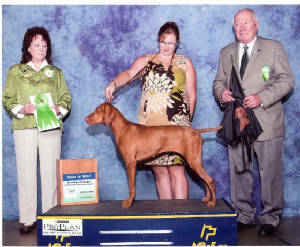 Vizslas tend to live a long life. On the average 15 years, they can live to be 18-20 years old. Make sure that you are getting your dog from a breeder that values health and well being. 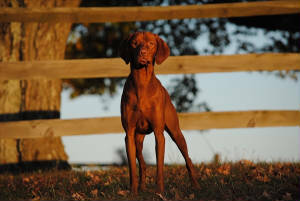 Don't rush to get your Vizsla, take time to question the breeders on health test, temperament test etc. These are very important for the well being of your new family member.